DSTV Commercial – Satellite for multiple units IS YOUR BLOCK READY FOR THE NEW DSTV SATELLITE? MultiChoice recently announced its annual price adjustments for DStv, which kick in on 1 April. The subscription fees of several packages will increase, including DStv Premium, Compact Plus, Compact, and Family. DStv Family was launched in South Africa in 2013 for R175 per month. Its price has increased steadily over the years and will become R249 per month from April – an increase of 6% from last year. The price of DStv Premium will increase to R809 per month, which is a 2.5% increase. DStv Extra was renamed to Compact Plus last year and will increase to R509 per month from R489, a 4.1% increase. 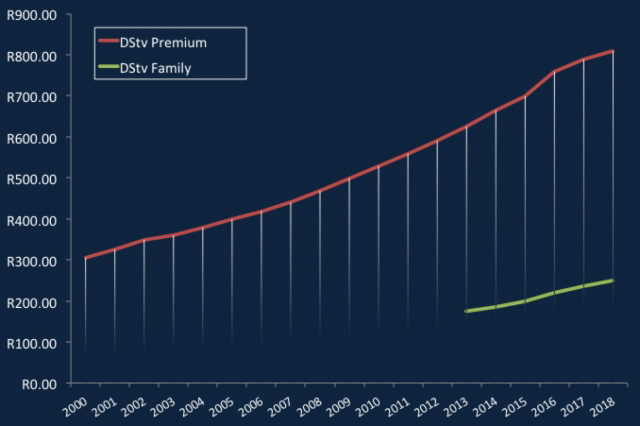 To see how DStv’s prices have increased over the years, the graph below plots the monthly fees of DStv Premium since 2000 and DStv Family since 2013.